Product code: ES6309 Categories: Sold Items, Sold Rings. The design of many Art Deco rings such as this one here, allows it to be worn on any finger including making a wonderful example of an Art Deco engagement ring that is sure to be admired. 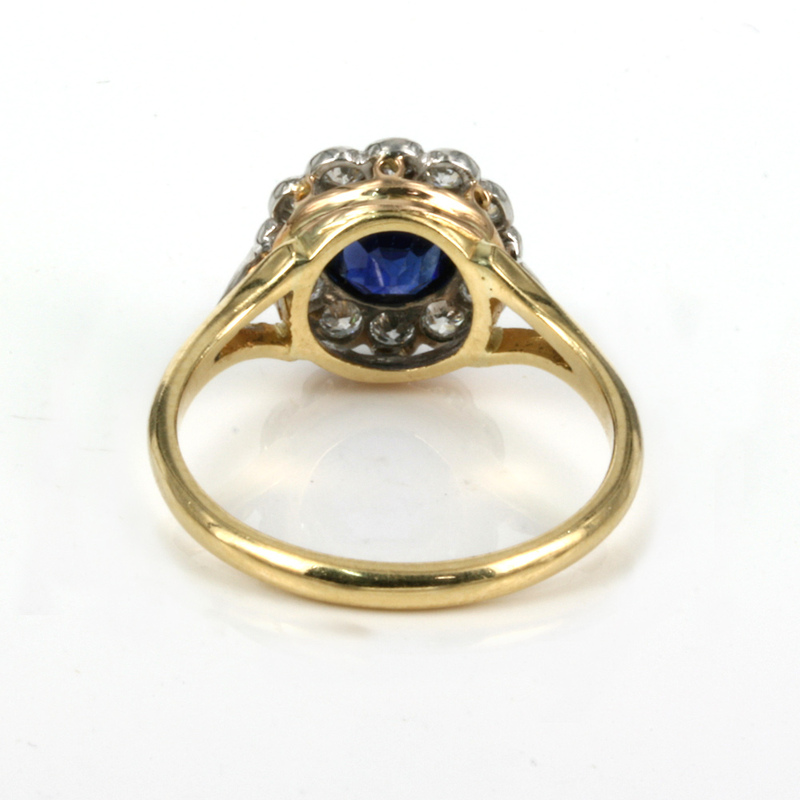 Art Deco rings are so elegant and refined and this sapphire and diamond ring is charming from all angles. Hand made in 18ct yellow gold and platinum, the combination of colours really makes the white of the diamonds and the blue of the sapphire really stand out. Firstly the oval facetted sapphire in the centre has such a vivid royal blue and measures 0.90 carats in weight and is not just bezel set, but has the millgrain finish around the edge which is quite often seen in Art Deco rings and other jewellery. Then there are twelve diamonds surrounding the sapphire again with the millgrain finish and these diamonds total 0.36 carats and sparkle beautifully. From left to right, this cluster section measures 11.4mm across by 11.7mm and leads to the triple split band in both 18ct yellow gold and platinum. It is this small but charming feature that adds so much character to the ring and can only be achieved when a ring is hand made over cast made rings which although can be made in large numbers, simply does not have the quality of hand made jewellery. If you have been after a lovely Art Deco sapphire and diamond cluster ring, then this might very well just be the one to fall in love with.